I found one annoyance about Mac OSX. 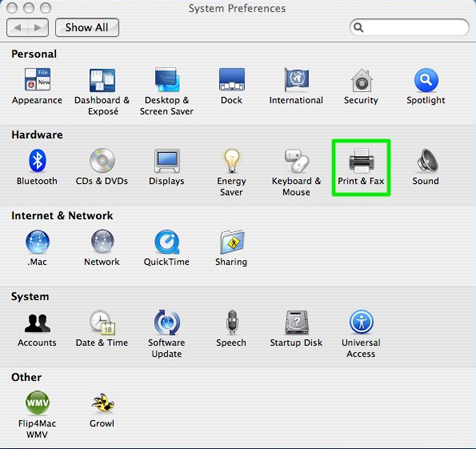 I could not figure out how to set my Mac up to print to our shared printer that is connected to a Windows XP machine. Well, thats not necessarily true. I figured it out once, but for some reason it just stopped working using the standard printer setup. Since then, I’ve been printing to PDF, emailing the document to myself, and grabbing it on the machine with the printer and printing the PDF. Since we were setting up Jonna’s new Vista machine anyway and working through those connectivity issues, I decided to work on getting printing to work for real. After culling through a bajillion posts today, I finally figured out how to do it. I figured this ‘pictorial’ could give you all of the steps you need to do without having to go through the effort that I did to get the information. As an aside, all images were grabbed and marked up using Skitch. Apple made it very non-intuitive to get to the advanced options. 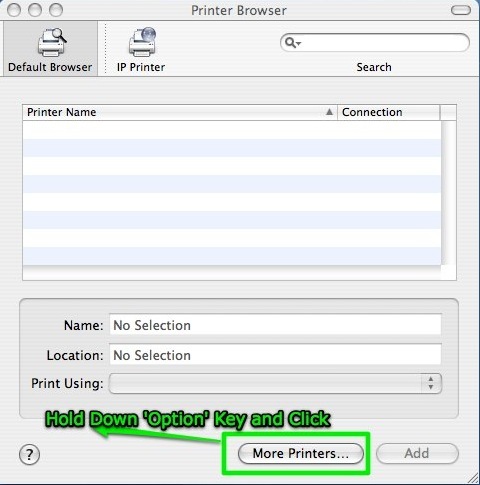 You have to hold down the Option key, then click “More Printers” in order to get to it. This annoyed me. The advanced option should be there no matter what. 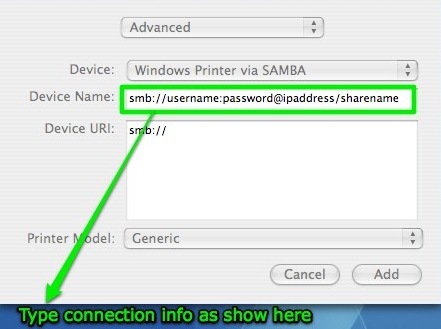 I shouldn’t have to do anything special to add the smb: address of the printer. 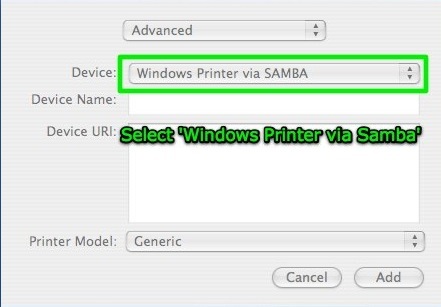 ‘username:password’ is the username and password to log into the Windows machine with. 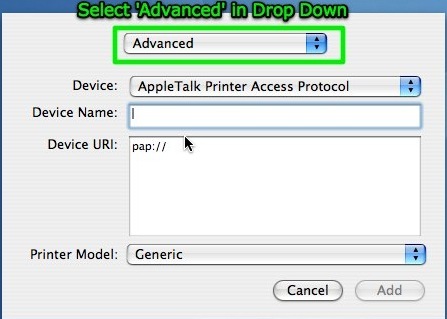 IP Address is the IP of the Windows machine with the printer, and finally share name is the name you gave to the printer when you shared it. 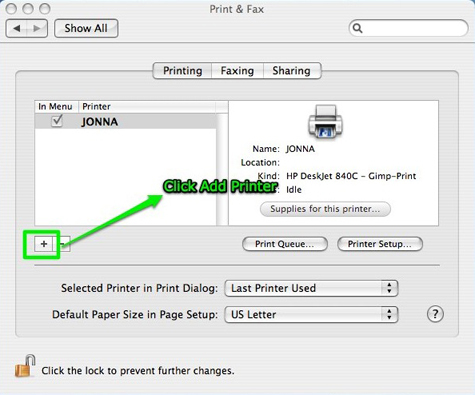 I hope this “graphical representation” of the process helps you get your shared printers up and running. This is what I needed. Rather, I had to read through many false starts and theories before getting to the meat of the issue, which was essentially getting to the ‘Advanced’ options in the print manager. Now you know the secret. Happy printing! 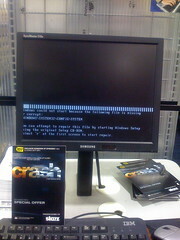 A really interesting article describing project dynamics around the Windows Vista Shutdown menu. I found this on Slashdot. I’ve been playing around with MindJet MindManager over the last week or so and I have to say, overall I really like it. Mindmapping provides a great mechanism in getting your thoughts down on paper and establishing relationships between different concepts, especially for someone who suffers from “chronic editor” syndrome such as myself. I’d love to post some examples of some of the things that I have been working on, but the only real “work neutral” mindmap I have available is the one I previously posted. Some really good examples can be found in the mindmaps that Cote produces. These are some really good examples of the complexity that can be represented using this technique. I had first read about mindmapping quite a few years ago in the book Quantum Learning: Unleashing the Genius in You by Bobbi Deporter (with Mike Hernacki). Deporter and Hernacki describe the Mind Mapping technique as “a whole brain technique using visual images and other graphic devices to form impressions”. The key piece of this, for me, has been the connection and breakdown of different concepts into sub concepts. The graphical nature of a mind-map, coupled with the distilling of the key concepts and relationships and visual representation, have allowed me to retain much more information while taking notes over the past week than I have previously experienced. I had attempted mind-mapping when reading Quantum Learning, but the extremely manual process (actual drawing) turned me off immediately. For me, it just seemed like too much work. That’s where Mind Manager comes in. With a few natural keystrokes you can string all of these concepts together, attach images or URL’s to the key concepts for further reference material, and flag concepts as priorities or something to pay attention to. The additional benefit of a tool to do this stuff is the ability to dynamically refactor your mind maps without having to throw away your piece of paper and recopy everything. The refactoring of these concepts has been something that I have been doing quite a bit. The folks at MindJet were nice enough to give me complimentary licenses for both the Macintosh and Windows environments. Since buying a Mac in June, I have decided to use it exclusively at home in order to learn as much about the environment as possible (and, of course, to justify the investment). So, I have had the opportunity to work on a few mind maps across the two environments. There is no ‘import’ or conversion necessary. I store the maps on my thumb drive, work on them at home, take them to work, and they just load and are ready for continued editing on the Windows platform. There are some differences between the two versions of the product. The Windows version has quite a bit of Microsoft Office integration. You can export your mind maps to Visio, Word, Excel and even Microsoft Project, in addition to JPG and PNG image formats and PDF. Both versions allow you to add task information to map nodes, including flagging nodes as resources and flagging them as quarter, half, three quarters done, as well as completed. I have not experimented with taking these types of mind maps and exporting them to project, but I’m assuming these move along with them (I can mess with it later and validate this). The Macintosh version has a more limited set of export formats. JPG and PNG are supported along with multiple flavors of RTF (Word, TextEdit) and PDF. For me, the use of this tool over the past week has been a really positive experience – on the Macintosh. The Windows version has some pretty major performance issues that are being talked about in the support forums as well as being addressed specifically by the Vice President of Engineering on the companies blog. The Windows machine that I am running MindManager on has 2G of memory and 80G of hard drive space. When docked, I run at a pretty high screen resolution (1280×1024 – maybe even higher). Docked, the software runs well enough to do the work I need to do as another connected concept hits me on some of the things I am working on. The strange part is that as soon as I undock and run in ‘laptop’ mode at the standard 1024×768 resolution, performance drops to the point where the software isn’t even usable. I’m not sure why this is the case, but at a seminar the other day with the Windows laptop, I was unable to take notes using the software whatsoever, as the software began exhibiting the symptoms mentioned in the above links. Overall, the technique of mind mapping is proving extremely helpful to me. As mentioned earlier, using the technique has increased the retention that I am experiencing while thinking through problems. The MindManager software is excellent – on a Mac. The Windows version needs some work to fix some of the performance challenges that I am experiencing. The price tag for the software is not the cheapest in the world either. A single user license for MindManager 6.0 Pro weighs in at a whopping $349, with the Basic and Macintosh versions available at $229. The question then becomes is the price tag worth the value received from the software. While I’m receiving a ton of value from using the software, the price of a single user license would definitely stop me from even taking the time to try it in the first place. While the company does make trial software available (both a 5 day express trial with no registration required and a 21 day “premium trial” of which the premium is registering with the company), I rarely “do” trials on products in this price range for the fear of getting addicted to them and having to pay for them. So the real question for me as I use the software further is whether I will buy it. Time will tell. I like to (and see it as an obligation) to support software I find useful with my wallet. The only real guarantee that useful software will continue to be available is if there is a community behind it, or, in the case of commercial software, people actually buy it. Once the “newness” of the software wears off, we’ll see if I continue to see value in the process and whether I keep using the software. At the point that I find it indispensable, I will definitely shell out the money to show my support for the product. And when that happens, you’ll definitely be the first to know. Error message recieved when getting updates. For some reason, this picture cracked me up. I know this has happened to me before but for some reason it didn’t strike me as weird until seeing this on Flickr. If you’ve been looking for a tool to make podcasting much easier than using Audacity, you might want to check out Castblaster. I’ve used it for quite some time and each release it just gets better and better. While browsing the Castblaster forums, I came across this screencast put together by Troy of the Rutters Ramblings podcast that shows a pretty complete picture of what Castblaster does. If you don’t feel like downloading the software, but are curious as to what you could get from it, check out the screencast. Yes, it can be that easy. Windows is weak: wheres the alternative? According to this CNET article, now is the perfect time for a Windows alternative to strike, as Longhorn is descoped and it is getting harder and harder to find a reason to actually upgrade from XP.